It’s funny what can get you off and running on a project. Dyeing cotton really wasn’t on my to-do list until I read an article in the Winter 2015 Spin Off where Dye-lishus premordanted cotton sliver was tested and reviewed. My first thought was, what’s the fuss with cotton that would make premordanted sliver desirable? Would it make dyeing easier? One of the things the Dye-lishus premordanted cotton sliver apparently can do, which home mordanting can’t, is allow the fiber to take acid dyes, which are made for dyeing protein fiber (wool, silk, etc). Dye-lishus’s USP is: you can dye this fiber with anything–acid dye, food colouring, procion dyes–and it will stick. However, my interest in mordanting my own cotton was stronger than my desire to try out the Dye-lishus fiber. Another day perhaps. 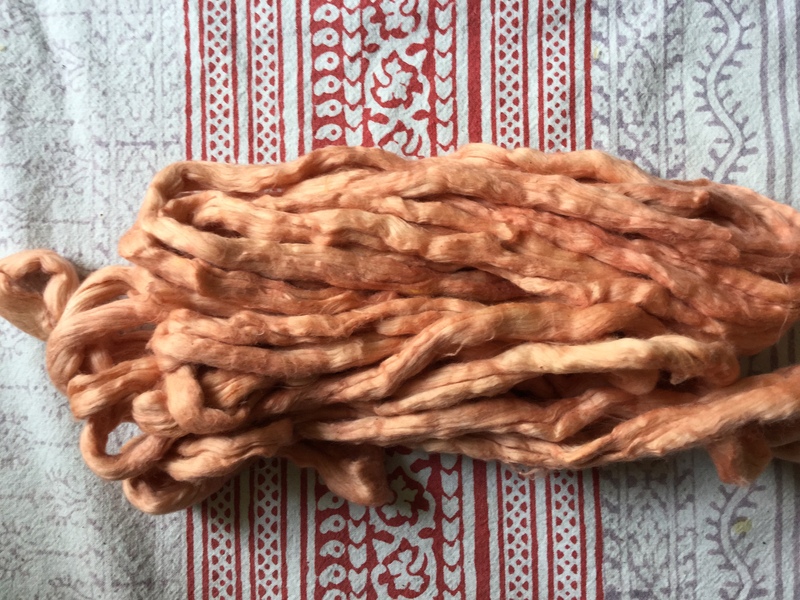 A quick internet search informed me that mordanting cotton for natural dyeing is a two- to three-step process, depending on the kind of cotton used. It’s not complicated. It’s not particularly labor intensive. It’s just one or two more steps than mordanting wool. There are some important things you should know before mordanting and naturally dyeing cotton. * Cotton is mordanted with tannic acid, then aluminium acetate. Those are different mordants than the ones used for wool. 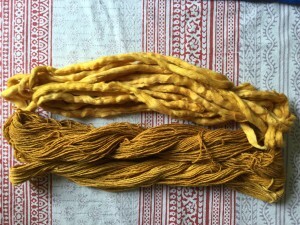 Both are available from natural dye suppliers. * Depending on what kind of cotton you’re going to dye, you may want to scour the yarn or sliver. I washed my yarn in very hot water with soda crystals. If you’re using organic cotton, don’t bother with this step. 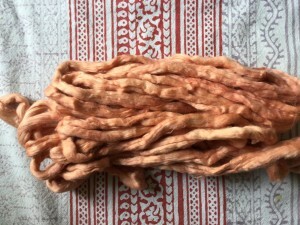 As with all aspects of natural dyeing–on cotton, wool or otherwise–there are many recipes. I used the simplest one I could find, which happened to be on the Wild Colours site. It has lots of information on natural dyes and mordants. I used 10 percent of weight of goods (WOG). To mordant 100 grams of fiber and yarn, I used 10 grams of tannic acid and 10 grams of aluminium acetate. It’s worth getting a digital scale to weigh the mordants. Put a clean yogurt pot on the scale, zero it, then tip in your mordant. 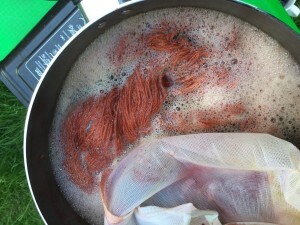 Soak your fiber/yarn for a good hour before adding it to a dye pot in which you have dissolved 10 grams of tannic acid. You want there to be enough hot water to cover the fiber and give it a bit of room. No need to heat the pot, just leave it until you’re ready for the next step. I left mine overnight. Repeat the process, but this time dissolve 10 grams of aluminium acetate and then add your wetted down fiber. Again, you need hot water to dissolve the aluminium acetate, but you don’t need to heat the pot. I left mine to soak overnight in a bucket. 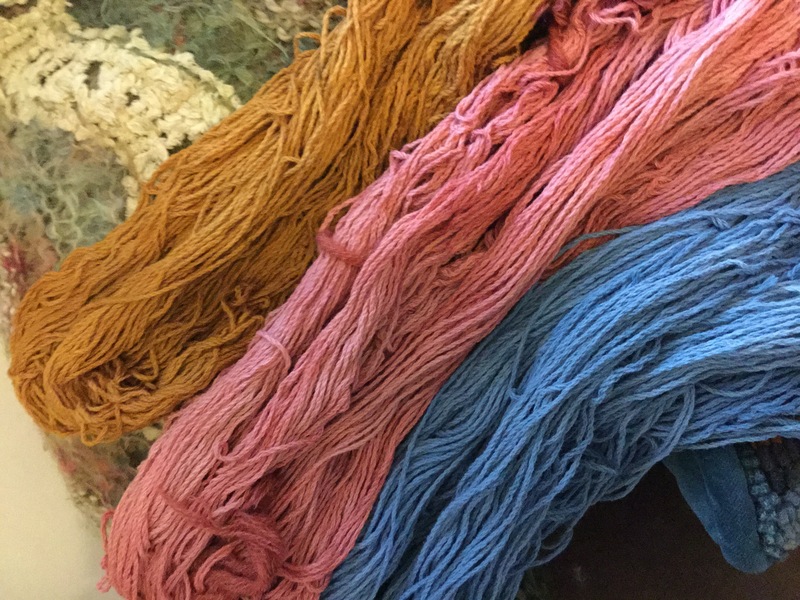 When ready to dye the fiber, make sure to rinse it well to get out any mordant that hasn’t attached to the fiber. Do it now or it makes the fiber a bit chalky after dyeing. Otherwise make sure to rinse your fiber well after dyeing. I dyed with madder and onion skins, because that’s what I had to hand. I soaked the madder root in hot water overnight. I used 50 percent WOG of madder. Onion skins are very generous in terms of dye yield. I used a few handfuls and that was plenty. Give the madder about an hour to simmer. I strained the root into a jelly bag, which I then returned to the dye pot. It saves you having to pick out little bits of madder from the fiber and makes sure you’re getting your money’s worth from the dyestuff. I fished out the onionskins with a slotted spoon put them in the compost. Once the fiber was in the dye pots I left them to simmer for about an hour. I then removed them from the heat and left them to cool. Dye baths made with natural dye stuffs do not exhaust the way acid dye baths do. That means there will appear to be a lot of color left in the dye pot. With acid dyes, you know the dye bath is exhausted when the water is clear. That doesn’t happen with most natural dye stuffs. Rinse your fiber well and leave to dry. Last, but not remotely least, cotton can be dyed naturally without any mordanting or pretreatment whatsoever. Just make an indigo vat, following Sal’s fabulous fruit vat instructions. Indigo is a substantive dye–like walnuts and lichen–and does not require any mordanting process. Just look at it. Beautiful! That seacell turned out great! 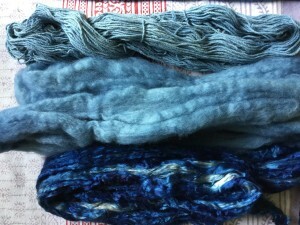 Im going to spin up some banana silk and see how it does with the Indigo. And I LOVE the color the onion skins give. I’m spinning up some organic cotton sliver right now to try some natural dyeing at my Guild’s dye day. Add pomegranate to your list of substantive dyes…something to try when they are in season. Great post, Rach, inspiring! Thanks Sal! Coreopsis and Dahlia are a week or two away from blooming. I’ve seen some weld in a hedge nearby. So watch this space. Sorry to be persnickety, but if you don’t mind, I would like to correct 3 statements below, and suggest rather than quick internet searches use a trusted source such as J.N. Liles’ book The Art & Craft of Natural Dyes. Lots of misinformation can be spread very quickly on the internet. 1. “* Cotton is mordanted with tannic acid, then aluminium acetate. ” is not true. Tannin should NOT be used with alum acetate, but can & should be used with alum. 2. In the note on scouring, “If you’re using organic cotton, don’t bother with this step.” is also not true. It does not matter if the cotton was grown with or without synthetic inputs, the cotton still has wax on the outside and pectins on the inside. Both interfere with dyeing. If you are dyeing cotton with natural dyes, you should always scour with soda ash at a simmer for several hours. Unless you are using the Dye-Lishus® cotton, which has already been scoured, in which case just wash it. 3. “Indigo is a substantive dye” is not true, indigo is a pigment, not even technically a dye. What is true is that pigments do not need a mordant. Also, using the Dye-Lishus® cotton removes the time factor in scouring and mordanting, and it also provides a safety factor if you work at all with children. Hello Eileen. I still haven’t tried your product, but I’ve found mordanting my own sliver to be quite simple, cost effective and successful. Thanks for your interest. I’m happy to have nudged you into natural dyeing. My idea with the premordanted fiber, yarn, & fabric was to get people starte, thinking having it pre-mordanted would alleviate some of the intimidation factor. Also the safety aspect lets us involve younger kids. A friend of mine called it “the gateway drug”. Exactly!